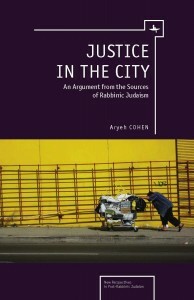 I am very happy to announce that my book Justice in the City: An Argument from the Sources of Rabbinic Judaism is out and available at Academic Studies Press and Amazon.com. You can now download and read the introduction of the book here (just click on the cover image). I hope that this will whet your appetite or stimulate your curiosity or at least disturb in a productive way, and hopefully you will buy the book and incorporate it in your discussions about how to make our part of the world a more just place.